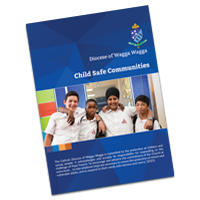 The Catholic Diocese of Wagga Wagga is committed to the protection of children and young people and continues to co-operate fully with the Royal Commission into Institutional Responses to Child Sexual Abuse. Reportable Conduct Scheme for employees and volunteers of the diocese. If you or someone close to you has suffered any abuse by a representative of the Catholic Church (school, parish or other group) in the Diocese of Wagga Wagga we invite you to contact us. Our professional staff will listen to your experience, respect your confidentiality and discuss all available options. Royal Commission's final report released On 15 December 2017 the Royal Commission presented a final report to the Governor-General, detailing the culmination of a five year inquiry into institutional responses to child sexual abuse and related matters. Becoming a Child Safe Organisation The Office of the Children’s Guardian encourages organisations to use a range of responses to manage the potential risks in their individual environments. Latest research: Enabling children and young people to raise safety concerns.